Equality Now Africa Director, Faiza Jama Mohamed, during the 15th anniversary celebration of the Maputo protocol in Nairobi. While gender equality continues to be a problem across the world, there has been a coordinated effort globally to work towards bridging inequality even though there is still to be done. Bridging this gap would ensure that women and girls achieve their full potential since it eliminates barriers that limit this. 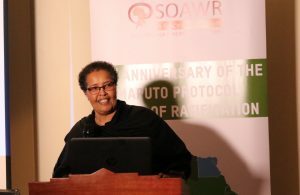 The global push to end inequality is anchored on Sustainable Development Goal (SDG) 5, that aims to ‘achieve gender equality and empower all women and girls.’ SDG 5 is further supported by context specific agreements and or charters that provide normative frameworks for implementing the gender agenda, such as Africa’s Agenda 2063 and The Protocol to the African Charter on Human and Peoples’ Rights on the Rights of Women in Africa also known as the Maputo Protocol that are culminations of consultations on the needs of women and girls on the continent. At the heart of bridging inequality, is evidence based implementation of initiatives that focus on the gender agenda. This evidence could be presented in the form of case studies or data and statistics that then help organizations working in this space to prioritize issues. The former, is used more often by Civil Society Organizations (CSOs) and advocacy organizations working on women’s rights but the latter is yet to be fully tapped into. While case studies give actual accounts, data and statistics can provide transformative input that could help CSOs put pressure on governments to make certain policy changes and more targeted initiatives for women’s rights organizations. Data is a major catalyst for many development processes and would be invaluable in implementing the gender agenda. Transformations in data ecosystems worldwide have resulted in better quality data being generated by private sector, civil society, academia and citizen based data communities which is central to its use. Additionally, the global push for open data has seen more data sets being published which makes it possible for organizations, groups or even individuals to ‘freely use, modify, and share this data for any purpose’. This solves the issue of access which is the first step if any data provided is going to be of use to anybody. CSOs and advocacy organizations working on women’s rights could therefore benefit from the availability of open data on women and girls relating to various aspects of development providing impetus to create synergies between the push for open data and the implementation of the gender agenda. The bigger challenge then becomes building the capacity of women’s rights organizations to leverage this data and make open data work for them. The general perception that women rights organizations work on the real issues, while data-focused CSOs are removed from the realities of gender inequality creates silos that make the challenge complicated. These silos make it difficult for both sides to collaborate and could result in data being put out that CSOs and women’s rights organizations do not find useful or relevant. A more collaborative approach needs to then be taken to make this data work. Having consultations between CSOs, women’s rights organizations and organizations that generate data, be it private sector, other CSOs, academia or citizen based data communities can provide a platform to jointly identify what data would be most useful in the push for gender equality and should thus be made open. Additionally, some data sets could be quite large making it problematic for these organizations to find what they need. This could be mitigated through capacity building, breaking down large data sets and presenting them in ways that CSOs and women’s rights organizations can easily pick up and use and repurpose into other forms such as infographics. Our work with the Africa Data Observatory continues to reveal gaps in the data put out on women and girls and the usefulness of this data in the push for gender equality and thus the increasing need to create these synergies and make data work for the gender agenda.